This description of the Book of Joel is from Easton's Bible Dictionary. 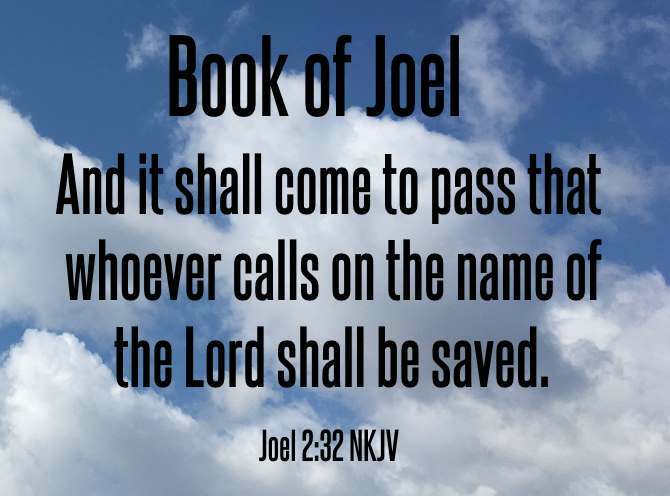 Joel, Book of: Joel was probably a resident in Judah, as his commission was to that people. He makes frequent mention of Judah and Jerusalem (Joel 1:14; 2:1,15,32; 3:1,12,17,20,21). A prophecy of a great public calamity then impending over the land, consisting of a want of water and an extraordinary plague of locusts (Joel 1:1-2:11). The prophet then calls on his countrymen to repent and to turn to God, assuring them of his readiness to forgive (Joel 2:12-17), and foretelling the restoration of the land to its accustomed fruitfulness (Joel 2:18:26). Then follows a Messianic prophecy (Joel 2:28-32), quoted by Peter (Acts 2:16-21). Finally, the prophet foretells portents and judgments as destined to fall on the enemies of God (Joel 3:1-21).